CMCS extensive experience in setting up bespoke Project Management Offices (PMO) and the Oversight of planning, design, construction and turning over of multi-billion real estate and infrastructure development projects has made CMCS extremely knowledgeable of what it takes to complete a project on time, within budget and in accordance with the objectives of the owners. To protect owners’ interests, CMCS provides an independent, reliable, transparent and timely assessment of the feasibility, budget, scope, planning, design, procurement and construction, quality, and risks aspects before they become costly issues that may jeopardize the successful completion and or the objectives of the project. Our track record of success includes the successful completion of mega master planned mixed-use communities, high rise residential and office towers, shopping malls, airports and infrastructure developments. Standard Forms, Reports, Logs, etc. CMCS Project Management Office (PMO) practice is designed to enable our clients to successfully execute their IT strategic initiatives by identifying, assessing, aligning and selecting the right project investments as well as protect them from wrong business practices when it comes to delivering those projects. CMCS experience in developing agile yet effective Project Management Office (PMO) has helped many of our clients to reduce their likelihood to encounter the high cost of project failure when it comes to selecting and delivering project investments. Our Project Management Office (PMO) practice focus on designing, building and implementing alignment between projects and strategic initiatives, project management best practices, project team accountability, project governance, transparent performance reporting and cultivating project management skills and talents. Our PMO implementation methodology has four steps: Organization’s Project Management Capabilities Assessment, Designing and Developing the PMO Solution, Implement Project Portfolio Management Information System (PPMIS) and Cultivating and Building Project Management Skills and Knowledge. During this stage, the CMCS team will diagnose and assess the organization strength and weakness in selecting the right projects and delivering projects right. We will assess the organization’s corporate organization and governance platform, asses the projects department’s organization and resources, assess the projects department’s governance and control and assess used project management and program management practices. This will enable CMCS to develop a detailed Strength, Weakness, Opportunities and Threats (SWOT) report that will provide the organization with a road map on the needed improvements and how to construct a Project Management Office (PMO) that will ensure the successful adoption of those improvements. Develop project management standard forms, documents, reports, logs, certificates, registers, checklists, etc. During this stage, CMCS will configure and implement the project management information system (PMIS) to provide our client with integrated project performance monitoring and controlling, automation of the project management processes and strategic, tactical and operational project performance dashboards. The PPMIS will be built using world leading project management software applications from PMWeb. CMCS can also work with other software applications should the client has this preference. What makes CMCS developed PMIS unique, is how we enable our clients to optimize the use of the big data of the important project information captured during the project life stages. This data can be shared with the authorized project stakeholders using informative yet easy to read performance dashboard. The project dashboard provides a single version of the truth on the performance and health of project schedule, cost, awarded contracts, risks, issues, quality, safety, actual performance and other important project information. The web-based performance dashboard enables authorized stakeholders to access vital project information from anywhere, anytime using any device. Our performance dashboard reporting is available in multiple languages depending on the stakeholder requirements. CMCS projects performance reporting can extend beyond reporting on common project objectives to cover other project benefits to the environment, society or economic stimulation to strengthen GRI reporting. CMCS is a certified sustainability services provider of GPM® Global, the world’s leading sustainable change delivery organization and signatories to the UN Global Compact and PRME (Principles for Responsible Management Education) initiatives. Through this affiliation, we are able to provide organizational assessments and training to support the alignment of organizational principles, values and strategic objectives to the benefits that projects produce. At the final stage of constructing the PMO, CMCS will assess the knowledge and skills competency of the PMO team project management to enable CMCS to develop and deliver the needed project management professional development programs. Our training programs are aligned with internationally recognized project management standards and are certified by the Project Management Institute (PMI), Green Project Management (GPM) and Knowledge Management Institute (KMI). The Project Management Postgraduate diploma is a one-year postgraduate program composed of 10 courses delivered in an executive style – 3 days per month – with a clear focus placed on Project Management knowledge and skills enabling the participant to deliver complex projects based on best practices. The curriculum draws heavily on a long, acknowledged experience of Subject Matter Experts (SMEs) in Project, Program, Portfolio, and Risk Management. The Project Management Postgraduate diploma is a practical hands-on professional development program. It focuses on advanced project management knowledge and skills meant to enable you to deliver small to complex projects based on best practices. The curriculum draws heavily on the long and acknowledged experience of practitioners and trainers in project, program, portfolio, and risk management. Diploma holders will be thoroughly taught by Subject Matter Experts and seasoned practitioners. In Lebanon, courses are offered at the American University of Beirut (AUB) campus, 3 days per month, in an executive education style, attracting professionals from all walks of life. In the UAE, courses are offered at the Higher Colleges of Technology through their Center for Excellence for Applied Research & Training (HCT-CERT) campus through the same model. CMCS solution partner e2eProjects is the industry leader in providing end to end Process & Project Management solutions through Microsoft EPM and SharePoint implementation. CMCS and e2eProjects work together to create the most innovative solutions to share your ideas, organize information, engage people and projects, discover insights and connect. We have always been technology pioneers with SharePoint customized implementations. 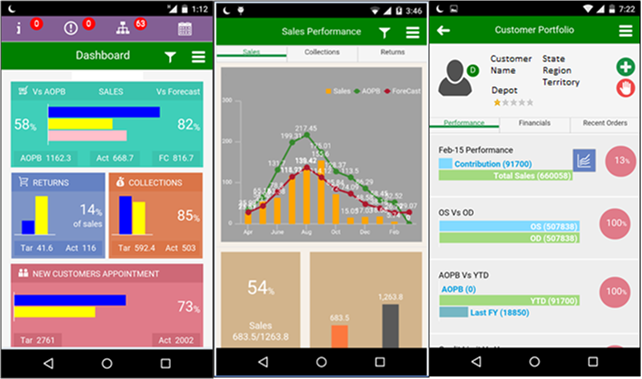 We have developed unique capabilities of Enterprise Mobility to bring SharePoint reports right to your mobile device. Whether you need to transition from your legacy systems to SharePoint or upgrade to Microsoft SharePoint Server 2010 or 2013, our team ensures a risk-free, seamless migration. 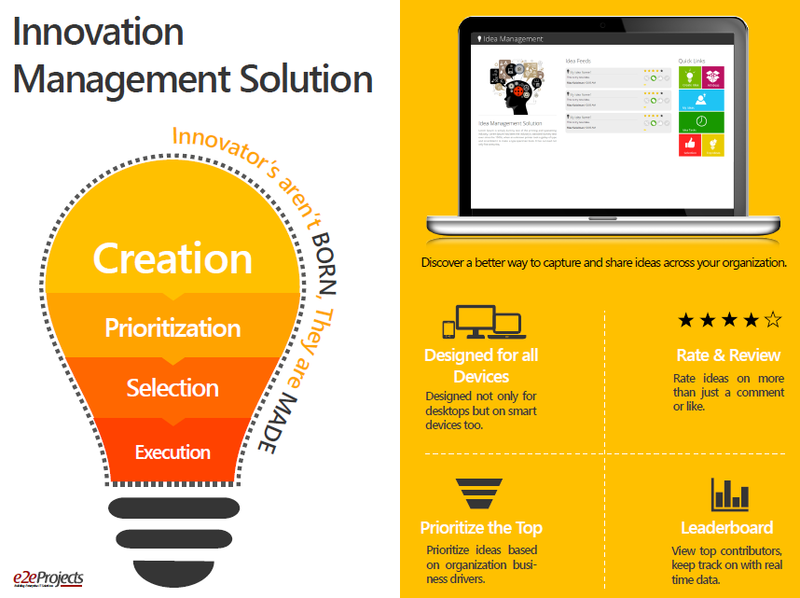 We analyze your demands; develop a migration strategy and then implement it in your SharePoint system. Our experience in Microsoft SharePoint document management starts by understanding your optimal workflow. We design, develop, and deploy SharePoint systems that let your employees work naturally while conforming to required standards. We can build a user-friendly SharePoint document library that stores, tracks, tags, retrieves, and archives your records quickly, easily, and securely. You can also control who views, edits, and deletes documents. This solutions could also seamlessly be integrated with your existing Project Management solution used internally allowing resources to use a single document management system and increase overall efficiency. Companies often face challenges to automate field sales and lengthy Customer/Vendor registration processes (Vendor code generation process via SAP and first order placement), product demos to farmers and their feedback implementation via the marketing team. Such lengthy processes lead to loss of opportunities and revenue. We have designed a solution specifically for the sales team to get real-time updates, daily sales reports, product/team performance reports, Vendor/customer registration, collections, outstanding payments and blocked customer details. This handy information increases the efficiency of the team right from manufacturing to customer delivery and after sales services as well. It also integrates market intelligence, customer portfolio, distribution and retail profile, product performance report, product catalog, AOPB & forecast and planning and marketing campaign planning and tracking. This application is designed on the most advanced platform- SAP UI5, and the data is stored on the Azure platform. Users can access/ update data via their smart phones, tablets, and computers. Idea management is the structured process for collecting, storing, prioritizing and selecting ideas from employees, customers and vendors. Convert the best ideas into products & processes to gain comparative advantage. Leverage the power of Social Computing, Collaborative Workspaces, likes, promotes etc. This solution enables you to discover better ways to capture and share ideas across organization and increase the value of Innovation & Portfolio Management. Throughout the project development process, realize the capacity to deliver new products on-time, get in-budget results and exploit the first mover’s advantage which will help the organization to achieve high performance in a dynamic business environment. The solution is tightly integrated with the organization’s home grown Demand Management Tool in SharePoint. The existing tool only has the ability to Identify and categorize Demands and CRs. With Project Server Integration, It helps organizations to run the complete process from Identification to Closure. Project Server and SharePoint are built in such a way that they provide organizations a complete custom product for end to end Demand Management. This solution creates & captures demands & change requests (D&CRs) across verticals like, Infrastructure, IT needs, Resourcing etc., to identify, track & execute requests based on the demand category followed by business process work flows. 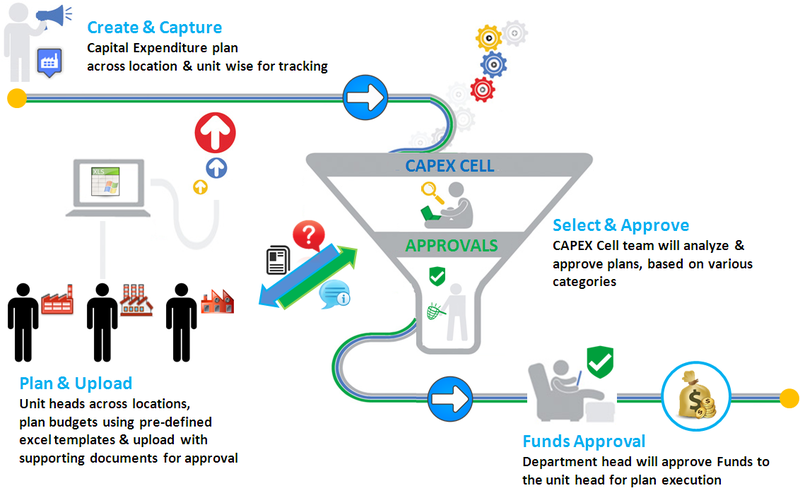 Capital Expenditure (Capex) program is one of the most crucial aspects of planning that an organization will ever conduct. Decisions made here impact profitability and even survival prospects for the future. Today’s CXO’s are confronted with a shift in thinking about expenses: they look for ways to move expenses from the Capital Expenditure (Capex) budget to the Operational Expenditure (Opex) budget. It’s an online solution portal to manage budget, track investments across BUs & visualize investment plans made by individual unit managers by submitting inputs like summary, supporting documents & schedule plans which leads to better visibility on budget & substantial ROI. This solution has predefined templates for note submission based on various categories, once it is selected for current FY implementation; approval process is initiated at BU & HQ. ESS solution is an Intranet/Internet based automation solution for all departments of your organization. It consists of Employee Profiles, HR Functions, Payroll Functions, Accounts/Finance, Administration and the Service desk. Staff/ consultants can initiate workflows related to their everyday task at any given time through the ESS. Each of the service request form is designed in such a way that it goes through approval cycles by the concerned department’s management team. This ensures that the company policies are automatically enforced at the application stage itself and reduce the turnaround time. 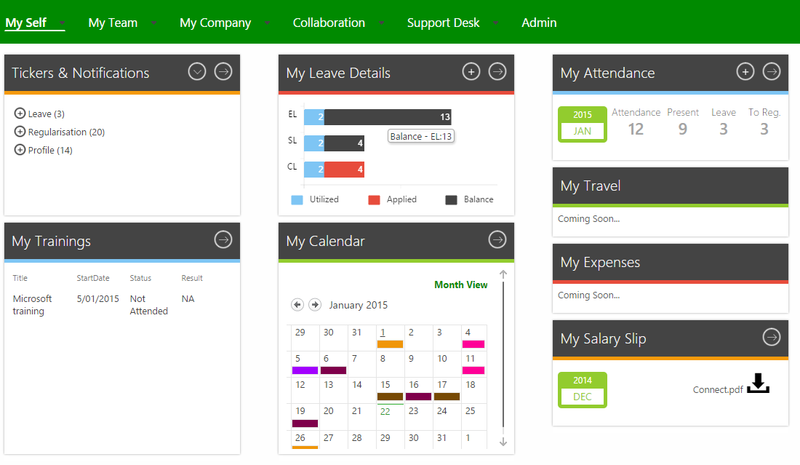 Both Employees and Managers can view and track the status updates. All concerned stakeholders receive email notifications as well. The top management can access the Dashboards to generate and view the relevant reports at any stage for avoiding delays and clearing pending requests. ESS is built with a combination of SharePoint Online and Office 365, and seamless data integration from various data sources like SAP, Oracle among others.